READING, Pa. – Albright head football coach John Marzka stressed to his team all week about finishing. Time and time again this past week he talked about how nobody remembers who started well, but rather people remember the team that finished well. 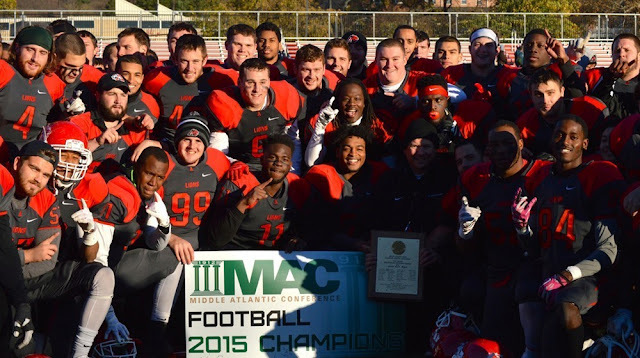 The 20th-ranked Lions took his words to heart and finished the season with a 38-13 victory over Lebanon Valley to clinch the 2015 Middle Atlantic Conference title. Albright finished the regular season with a 9-1 overall record and an 8-1 record in the MAC to secure its first conference crown since earning a share of the league title in 2008. With the win, Albright also earned the conference's automatic berth into the NCAA playoffs which will mark the Lions first appearance since the 2009 season. It also marks the Lions 10th conference championship. The field for the 2015 Division III football playoff will be announced on Sunday at 6 p.m. on NCAA.com. Junior wide receiver Malik Gilmore turned in a brilliant performance to lead Albright to the victory. He caught a touchdown pass, threw a touchdown pass and also blocked a field goal attempt. After Lebanon Valley took a 7-3 lead early in the second quarter on a touchdown pass, Gilmore took over. Just 50 seconds later, Gilmore took a lateral pass from Mike Knight and found Malik Jackson all alone for a 52-yard scoring play that put the Lions in front to stay at 10-7. On the Lions next drive he hauled in a 27-yard scoring pass from Knight to increase the Lions lead to 17-7 with 8:09 to play in the second quarter. On Lebanon Valley's next drive, the Dutchmen lined up for a field goal attempt but Gilmore blocked the attempt to set the Lions up on their own 34-yard line. Albright needed just three plays to extend the lead to 24-7. Knight connected with Gerrod Gainer for 49 yards and then hooked up with Gilmore for a 14-yard gain and Chris Dawson capped the drive with a 3-yard touchdown run. Senior Daniel Sobolewski converted two field goals in the third quarter, one from 37 yards and one from 19 yards, to push the Lions lead to 30-7. Knight capped the scoring for Albright when he scored from three yards out with 10:27 to play in the game. Lebanon Valley scored the final points of the game on a touchdown pass with 39 seconds left in the contest. Although Gilmore shined for the Lions, there were plenty of heroes on Saturday. Dawson rushed for a season-high 111 yards and a touchdown and Knight turned in one of his top passing performances of the season. He finished the game 16-of-20 for 198 yards and a touchdown. Jackson hauled in seven passes for 113 yards and a touchdown, while Gilmore finished the game with three catches for 52 yards and a touchdown. Sobolewski continued his outstanding season as he was 3-for-3 on his field goal attempts and also converted all three of his extra point attempts. Senior Jamal Hayden led the Lions defensive effort as he recorded 11 tackles, had 2.0 sacks and finished with 3.0 tackles for loss. Will Harrison also intercepted a pass, which was his third of the season. Albright, which was ranked No. 2 in the East Region, is anticipating hosting a first round NCAA playoff game. If the Lions are chosen to host it would mark the first time in school history that Albright would host an NCAA game.